As you know, every language has its own collection of wise sayings. They offer advice about how to live and also transfer some underlying ideas, principles and values of a given culture / society. 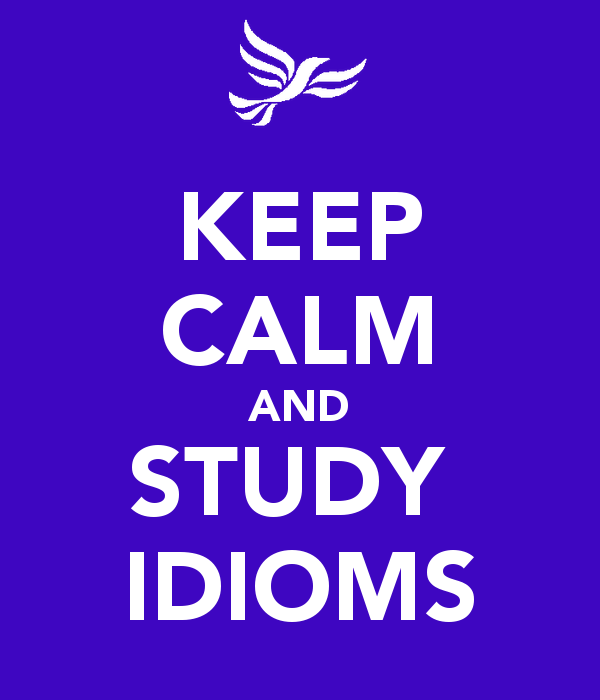 These sayings are called « idioms » – or proverbs if they are longer. These combinations of words have (rarely complete sentences) a « figurative meaning »and they basically work with « pictures ». A good List of commonly used idioms and sayings (in everyday conversational English), can help to speak English fluently by learning English idiomatic expressions. This is the list we studied in 2015 – 2016. It means to work late into the night. It alludes to working by the light of an oil lamp late in the night. To stay up late working or studying. Example: I have a big exam tomorrow so I'll be burning the midnight oil tonight. It means to go to bed. Linen was once the common bedding material for sheets. Linen sacks/storage bags (like burlap bags/hessian bags today) were once more commonly used for things like grain (linseed in the old process of extracting linseed oil) etc. Linen (flax), also the same material/fabric as was used for bed linen/sheets, pillow slips and blankets etc. The word Sac in French is translated to sack or bag in English. Example: Now I am going to hit the sack, I am so exhausted. If you're out of your depth, you're in a situation that you don't have the experience to handle, or the knowledge to understand. Example: I was out of my depth in the Upper-intermediate group, so I asked my English teacher to be moved to the Intermediate group. It means legal and fair, in an honest way. When everything is above board, it's perfectly legal, with nothing hidden. Possibly derived from card playing and the fact that card players who keep their hands above the table (or above "the board") can be seen to be playing honestly, without cheating. Example : My Aunt Jane always said it was best to be open and above board in everything, and especially in religion. We use this idiom to speak about something that at first appears to be bad or unlucky but is actually good. Something that seemed terrible, but actually produced positive results. Example: Losing my job was a blessing in disguise. I never would have found this one if it hadn't happened. It means to be very closely connected with someone. To be always together. Absolutely inseparable (implying as inseparable as conjoined twins attached at the hip). Example: John and Brian have been joined at the hip since they met at primary school. They're more like soulmates than friends. If you bite your tongue, or also ''hold your tongue'', you force yourself not to say something you really want to say. You make a conscious effort not to say anything, usually for the sake of politeness or peace. Example: I wanted to tell my boss he was completely wrong, but I bit my tongue and just sat there. Note: These two idioms have the same meaning, though "hold your tongue" is more old-fashioned than "bite your tongue". It means getting to the point, leaving out all of the unnecessary details. To talk about or deal with the important parts of a subject and not waste time with things that are not important. "Jannings escapes... Cut to chase." Example: I know you are busy and have little time to spare, so I'll just cut to the chase and tell you that your car has a flat tyre. It means in the finest detail. to be able to give all the facts. It is an old English saying that means that a speaker or a writer can back up a statement or opinion with precise facts and details and can even cite a reference of authority. Example: I know all about it, chapter and verse. If you make a slip of the tongue, you make a small mistake when speaking, such as using the wrong word. It is an accidental and usually trivial mistake in speaking. Something that you say by accident when you intended to say something else. Example: A journalist made a slip of the tongue when reading out the scores. He said Manchester United had lost by a goal, instead of saying they'd won by a goal. You can say something is a pipe dream if it is a plan or a dream for the future that could never come true or be achieved. The origin of this idiom is probably related to the fact that the drug opium can be smoked in a pipe, and when it is taken people often have very pleasant, dream-like experiences. Example: The idea of a perfect world in which everyone lives in peace and harmony is just a pipe dream. If two people are talking at cross-purposes, they do not understand each other because they are trying to do or say different things but they do not know this. They think that they are talking about the same thing when in fact they are not. To (usually unintentionally) be in opposition or to have differing ideas or intentions. Example: I think we're talking at cross-purposes here. You mean the old school, but I was talking about the new one. If you earn your stripes, you do something to prove that you have the skills or ability for a particular job or rank.The origin is probably related to the fact that in many organisations, including the armed forces, police forces, fire brigades, the boy scouts, etc., a person's rank is often shown by the number of stripes that are sewn onto the shoulder of their uniform. Example: She earned her stripes as a local reporter before becoming a foreign correspondent. It means to lose one's temper. To get very angry or to become suddenly enraged. This idiom comes from the days when blacksmiths, the people who make horses shoes from iron, used to make their own hammers with metal and wood. They used to heat up the hammers so that the body of the hammer and its head would get stuck together. If it wasn't done properly, the first time the smith would swing the hammer, the head would fly off the handle, which was obviously potentially Dangerous. Example: He really flew off the handle when I suggested selling the house. It means something pleasing to listen to, especially music-related. Soft and pleasant popular music; music that is sweet to the ear. Hearing either your favourite kind of music, or hearing someone with an accent that you just adore. Example: The theme music in the movie Bagdad Café is ear candy. Copyright © 2018 William Bertrand Formation Langues. Tous droits réservés.